The goal of this project is to reach out to the at-risk demographics in your community and have the students learn fire safety by doing fire safety. Who is at-risk can be different in each community-it can be low-income, elderly, rental properties and off-campus properties, among others. There are a variety of techniques that you can use to help you schedule visits, or you can simply canvass a neighborhood, going door-to-door. This is something that can be most effective if there is a significant fire in your community. In the days afterwards, there is a heightened awareness among the public about fire safety and they are very receptive to having smoke alarms installed. By having crews made up of fire fighters and students going door-to-door, you can have a lot of success by using the teachable moment after a fire. The elderly are, statistically, an at-risk demographic for a variety of reasons, according to both the US Fire Administration and the National Fire Protection Association. It is very common to find their homes without enough smoke alarms (or even none at all) or the smoke alarms that are in place are not working. 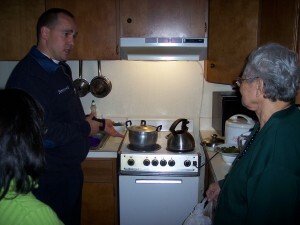 Often these visits can be schedule by working with the agency in your community that liaisons with the elderly, such as Senior Services or Meals on Wheels to promote the availability of smoke alarms. This demographic is also at a statistically-higher risk for fire, according to USFA and NFPA. A very effective way to gain entry into these households can be working with social service agencies that provide services to this group. Having someone from the agency as a part of your team, helping to schedule the visits and then even go with your team can provide a familiar face to the residents. If your community has a specific immigrant population, they may not be familiar with the need for smoke alarms or even aware of what a smoke alarm is because it was not something that they may have had in their country. Social service or faith-based agencies can be very helpful in gaining entry into this community. If you have personnel from these agencies they can help you schedule the visits and also accompany you to serve as translators, if needed. During training, they can also familiarize the team with any possible social norms to be aware of when visiting these homes. Student availability is often dictated by their class schedule. They may be available during the week, but it may be only in small numbers, or just one or two students at a time. If you are looking to do them on a weekend, Saturday is the best day for many of the people in the community. Realistically, students often sleep in later on Saturdays, but for the residents, mornings might be the best time to catch them at home before they start doing their errands or head out for the day. It is a balancing act…you know your community and students best, so try to find times that work well for both groups.